This is my 1993 Ford Special Service Mustang LX 5.0 police sedan. It was originally a Texas Highway Patrol unit. It was delivered from Leif Johnson Ford in Austin, Texas in the late summer of 1993. This Mustang (1 of only 200 for the Texas DPS in 1993) was issued to Trooper B.A. Oppermann in Lee County, Texas near Giddings. It was retired from police service in October 1997 with 101K miles and sold at the state police vehicles auction in February 1998. It was purchased by Danny Jones of College Station, Texas and was driven by his spouse until September 25, 1998. That's when I saw it for sale on the internet. I made arrangements to see the car. I test drove it out on Texas Highway 21 west of Bryan. I instructed Mr. Jones NOT to sell the Mustang until I could return with the $6,400.00 to buy the car. I drove it periodically until February of 2002. At 135,000 miles the car underwent some restoration work. The idea was to preserve it as closely as possible. It was painted solid black and continued to be used as a daily driver. It made a few rounds to car shows in 2002 but never really drew much attention as a solid black highway patrol unit. Then, in January 2003 funds were released by Roman's wife to paint it to historical accuracy by shooting the top, trunk and hood white. The decals are magnetic and were made from photographs. The lightbar is reconditioned and came off of a Baytown PD Crown Victoria. This Mustang has a non-functioning old Dacatur radar unit, fully operational Motorola Syntor X9000 64 channel VHF radio, functional lightbar, siren and control switches. It is now driven LESS than once a month and taken BY TRAILER to car shows and car related events across Texas and western Louisiana. 2003 was the most successful year yielding eight 1st place awards, one second place award and one honorable mention for best police vehicle display. 2004 saw a 1st place award at the M.C.A. National Show in Biloxi, Mississippi and in 2006, a first place award was secured in St. Louis, Missouri. Total cost of restoration to date: Approximately $15,900.00 (includes price of car when purchased used). The full restoration of this retired Texas Highway Patrol unit was authorized by Colonel Thomas Davis, Director of the Texas Department of Public Safety. This Mustang NEVER displays the DPS door insignia or emergency lights when driven on public streets or roadways. All the external equipment was modified to be easily removed and concealed. The original DPS fleet number is M3-391. 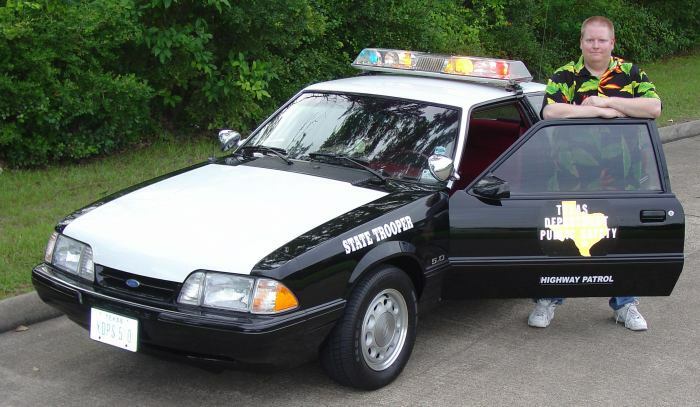 This fully restored 1993 Texas DPS Mustang is one of only seven restored Texas Highway Patrol Mustangs in the nation. This Mustang and its display conform to all statutes of the Texas Penal Code and Texas Government Code. NO taxpayer dollars were used in rebuilding this Mustang. The funding came only from personal expenses. It is recommended that you check with your local & state laws before beginning ANY police car restoration project. Some states, such as Florida have very strict laws and rules governing the ownership and use of personally owned police vehicles. April 2006: New Updates to the car include having the wheels refinished by Keystone Wheel Company - Tyler, Texas; Installed brand new Mirada tires; had paint redone on lower half of car and had car buffed to high black mirror shine. Thanks to Wayne, Tommy and Ramiro at GATEWAY TIRE of Lufkin; BODYMASTERS Paint & Body Shop of Lufkin and Richard Peebler of Brake Express in Lufkin, Texas. Roman Collins with his restored Texas Highway Patrol Mustang - July 2003. Above: This is a photo made on April 30th, 2006 following the Fun Ford Weekend car show near Baytown, Texas. Interior view of Roman's '93 restored DPS Mustang. You can see the Decatur radar, Motorola radio control head and light switches. No detail was missed such as the "no fleet accidents" sticker on the passenger dashboard. The radio control head reads: "DPS BASE" and the DPSOA magnetic clip hangs from the radio bracket to hold tickets issued to motorists during a trooper's shift. Below: A snapshot of the engine area. This is a shot of the trunk display when at car shows. Above: This is a photo taken by a member of the Red River Mustang Club in Bossier City, Louisiana. It was taken in September 2004 at their annual show. Below: Photo made in summer 2004 behind my residence. Note the western style hat in the rear window. This was common to avoid damage to the hat with all the stuff in the back seat. 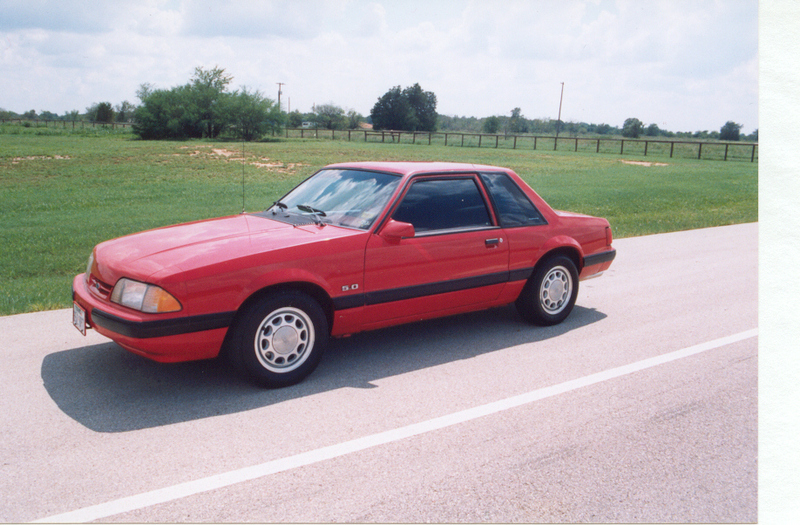 Above: This is a picture of Roman's Mustang the day it was purchased from Mr. Danny Jones of Bryan, Texas on September 28, 1998. Below: This is a picture of the '93 Mustang just prior to being painted back to its original black and white DPS colors.